In this article, we’ll take a look at the challenges involved in building real-time applications and how emerging tooling is addressing them with elegant solutions that are easy to reason about. 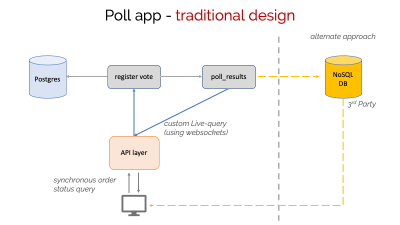 To do this, we’ll build a real-time polling app (like a Twitter poll with real-time overall stats) just by using Postgres, GraphQL, React and no backend code! The primary focus will be on setting up the backend (deploying the ready-to-use tools, schema modeling), and aspects of frontend integration with GraphQL and less on UI/UX of the frontend (some knowledge of ReactJS will help). The tutorial section will take a paint-by-numbers approach, so we’ll just clone a GitHub repo for the schema modeling, and the UI and tweak it, instead of building the entire app from scratch. This can be replaced with any frontend framework, Android or IOS by following the client library documentation. You can work with other databases but with different tools, the principles outlined in this post will still apply. You can also adapt this tutorial context for other real-time apps very easily. Fetch the poll question and a list of options (top left). Allow a user to vote for a given poll question (the “Vote” button). Fetch results of the poll in real-time and display them in a bar graph (top right; we can gloss over the feature to fetch a list of currently online users as it’s an exact replica of this use case). Building real-time apps (especially as a frontend developer or someone who’s recently made a transition to becoming a fullstack developer), is a hard engineering problem to solve. The frontend updates a database with some information; A user’s vote is sent to the backend, i.e. poll/option and user information (user_id, option_id). Vote data is first processed by an register_vote service (assume that some validation happens here) that triggers a poll_results service. Real-time aggregated poll data is relayed by the poll_results service to the frontend for displaying overall statistics. Any of the sequential steps could go wrong, leaving the UX hanging and affecting other independent operations. Requires a lot of effort on the API layer as it’s a single point of contact for the frontend app, that interacts with multiple services. It also needs to implement a websockets-based real-time API — there is no universal standard for this and therefore sees limited support for automation in tools. The frontend app is required to add the necessary plumbing to consume the real-time API and may also have to solve the data consistency problem typically seen in real-time apps (less important in our chosen example, but critical in ordering messages in a real-time chat app). Many implementations resort to using additional non-relational databases on the server-side (Firebase, etc.) for easy real-time API support. Let’s take a look at how GraphQL and associated tooling address these challenges. A request type for requesting nested data from a data source (which can be either one or a combination of a database, a REST API or another GraphQL schema/server). A request type for writing/relaying data into the aforementioned data sources. A request type for clients to subscribe to real-time updates. GraphQL also uses a typed schema. The ecosystem has plenty of tools that help you identify errors at dev/compile time which results in fewer runtime bugs. Live-queries (subscriptions) are an implicit part of the GraphQL specification. Any GraphQL system has to have native real-time API capabilities. A standard spec for real-time queries has consolidated community efforts around client-side tooling, resulting in a very intuitive way of integrating with GraphQL APIs. GraphQL and a combination of open-source tooling for database events and serverless/cloud functions offer a great substrate for building cloud-native applications with asynchronous business logic and real-time features that are easy to build and manage. This new paradigm also results in great user and developer experience. 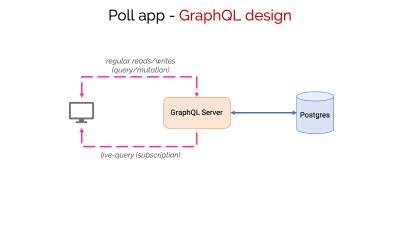 With that introduction to GraphQL, let’s get back to building the polling app as described in the first section. Fetch the poll question and its options. Let a user cast a vote. Display a real-time dashboard for poll results. To deploy a GraphQL backend (see next point below) and a Postgres instance. A ready-to-use GraphQL server on Postgres. For easily integrating clients apps with a GraphQL server. To run our React app. 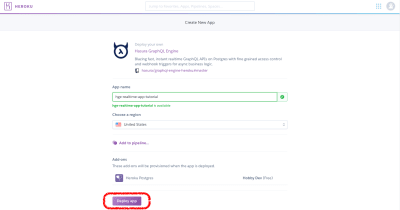 We will deploy an instance each of Postgres and GraphQL Engine on Heroku’s free tier. We can use a nifty Heroku button to do this with a single click. Note: You can also follow this link or search for documentation Hasura GraphQL deployment for Heroku (or other platforms). What we’ve done so far is deploy an instance of Postgres (as an add-on in Heroku parlance) and an instance of GraphQL Engine that is configured to use this Postgres instance. As a result of doing so, we now have a ready-to-use GraphQL API but, since we don’t have any tables or data in our database, this is not useful yet. So, let’s address this immediately. As you can see, the schema is a simple, normalized one that leverages foreign-key constraints. It is these constraints that are interpreted by the GraphQL Engine as 1:1 or 1:many relationships (e.g. poll:options is a 1: many relationship since each poll will have more than 1 option that are linked by the foreign key constraint between the id column of the poll table and the poll_id column in the option table). Related data can be modelled as a graph and can thus power a GraphQL API. This is precisely what the GraphQL Engine does. A table to capture the poll question. To record a user’s vote. Download the GraphQL Engine CLI. That’s it for the backend. You can now open the GraphQL Engine console and check that all the tables are present (the console is available at https://<app-name>.herokuapp.com/console). Note: You could also have used the console to implement the schema by creating individual tables and then adding constraints using a UI. Using the built-in support for migrations in GraphQL Engine is just a convenient option that was available because our sample repo has migrations for bringing up the required tables and configuring relationships/constraints (this is also highly recommended regardless of whether you are building a hobby project or a production-ready app). The frontend in this tutorial is a simple app that shows poll question, the option to vote and the aggregated poll results in one place. As I mentioned earlier, we’ll first focus on running this app so you get the instant gratification of using our recently deployed GraphQL API , see how the GraphQL concepts we looked at earlier in this article power the different use-cases of such an app, and then explore how the GraphQL integration works under the hood. NOTE: If you are new to ReactJS, you may want to check out some of these articles. We won’t be getting into the details of the React part of the app, and instead, will focus more on the GraphQL aspects of the app. You can refer to the source code in the repo for any details of how the React app has been built. You should be able to play around with the app now. Go ahead and vote as many times as you want, you’ll notice the results changing in real time. In fact, if you set up another instance of this UI and point it to the same backend, you’ll be able to see results aggregated across all the instances. So, how does this app use GraphQL? Read on. In this section, we’ll explore the GraphQL features powering the app, followed by a demonstration of the ease of integration in the next one. To show the poll results, we need to derive the count of votes per option from the data in vote table. We can create a Postgres View and track it using GraphQL Engine to make this derived data available over GraphQL. The poll_results view joins data from vote and poll tables to provide an aggregate count of number of votes per each option. 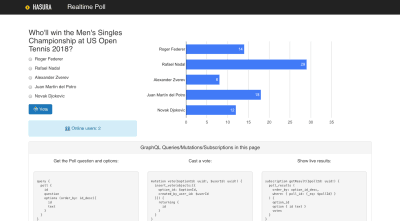 Using GraphQL Subscriptions over this view, react-google-charts and the subscription component from react-apollo, we can wire up a reactive chart which updates in realtime when a new vote happens from any client. The Apollo Client SDK needs to be pointed at a GraphQL server, so it can automatically handle the boilerplate code typically needed for such an integration. So, this is exactly what we did when we modified src/apollo.js when setting up the frontend app. One thing to note here is that the above subscription could also have been a query. Merely replacing one keyword for another gives us a “live-query”, and that’s all it takes for the Apollo Client SDK to hook this real-time API with your app. Every time there’s a new dataset from our live-query, the SDK triggers a re-render of our chart with this updated data (using the renderChart(data) call). That’s it. It really is that simple! In three simple steps (creating a GraphQL backend, modeling the app schema, and integrating the frontend with the GraphQL API), you can quickly wire-up a fully-functional real-time app, without getting mired in unnecessary details such as setting up a websocket connection. That right there is the power of community tooling backing an abstraction like GraphQL. GraphQL is meant to be consumed directly by frontend apps (it’s no better than an ORM in the backend; real productivity benefits come from doing this). So your tooling needs to be smart about efficiently using database connections and should be able scale effortlessly. It follows from above that a mature role-based access-control system is needed to authorize access to data. If you are new to the GraphQL ecosystem, handwriting a GraphQL schema and implementing a GraphQL server may seem like daunting tasks. Maximize the automation from your tooling so you can focus on the important stuff like building user-centric frontend features. As trivial as the above efforts seem like, a production-grade app’s backend architecture may involve advanced GraphQL concepts like schema-stitching, etc. Moreover, the ability to easily generate/consume real-time APIs opens up the possibility of building asynchronous, reactive apps that are resilient and inherently scalable. Therefore, it’s critical to evaluate how GraphQL tooling can streamline your architecture. You can check out a live version of the app over here. If you’d like to explore the database schema and run test GraphQL queries, you can do so over here.